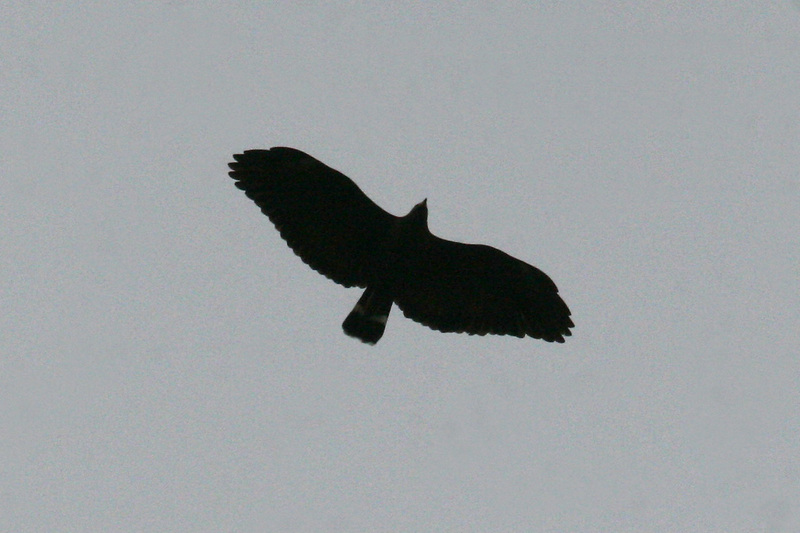 Common Black Hawk is an uncommon, but regular, migrant in spring and fall. It is a rare summer visitor, and occasional breeder in very small numbers. 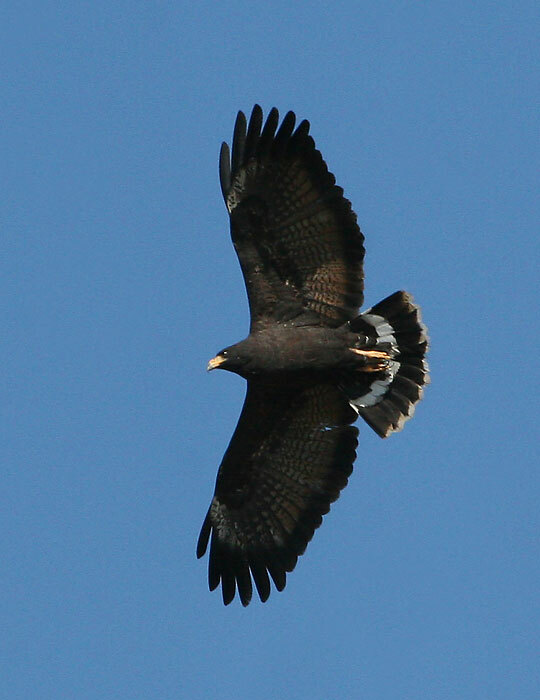 Common Black Hawk migration starts in SE Arizona in late February and goes through late March, with a few stragglers passing through during April and early May. Early return migrants begin heading south in late July, and continue through September, with the occasional straggler passing through as late as October. 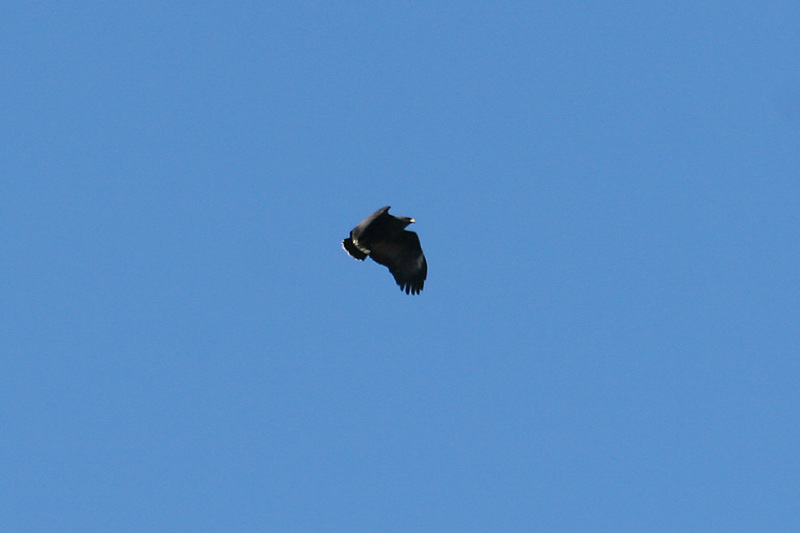 The odd summering or breeding Common Black Hawk could be encountered anytime in SE Arizona from March to September. Despite the name, Common Black Hawk is a rare bird in the USA, with about 250 breeding pairs. Most breeding Common Black Hawks are in Arizona, with a few additional sites in Utah, New Mexico and Texas. The main US population is concentrated in central Arizona, to the east and north of Phoenix. 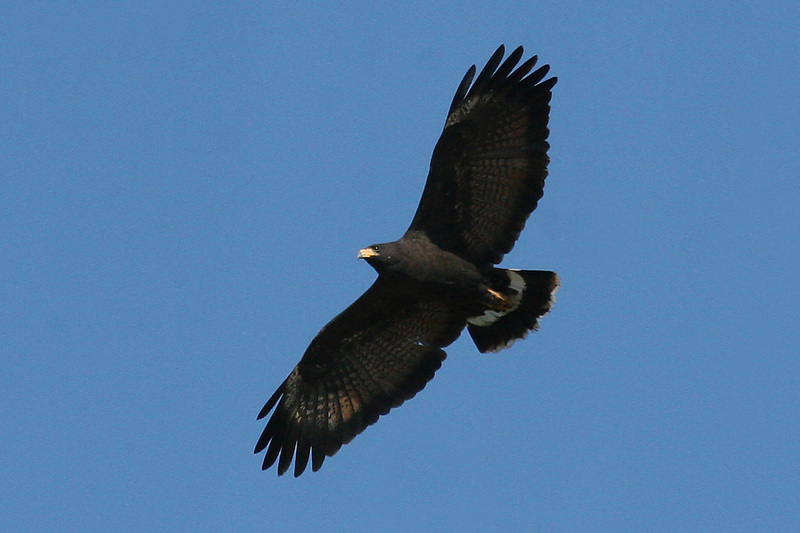 Elsewhere, Common Black Hawk is indeed a common hawk in parts of Mexico, Central America and northern South America. Migration takes place primarily along river valleys. Common Black Hawks usually roost overnight in large cottonwood trees along a river, and follow the route of the river as they migrate by day. 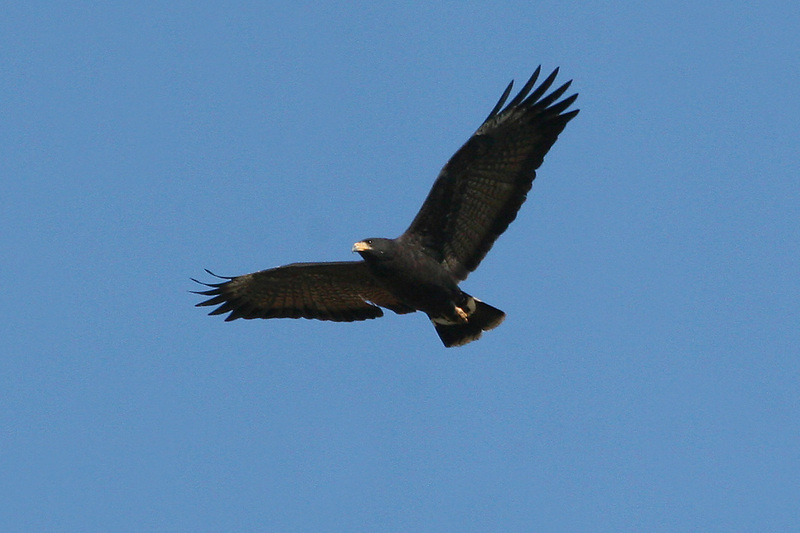 Common Black Hawk breeds in riparian habitat, with large cottonwood and willow trees, near water. Common Black Hawks are regular on migration in SE Arizona, with the spring migration in late February and March being the most reliable and popular with birders (see map, below). 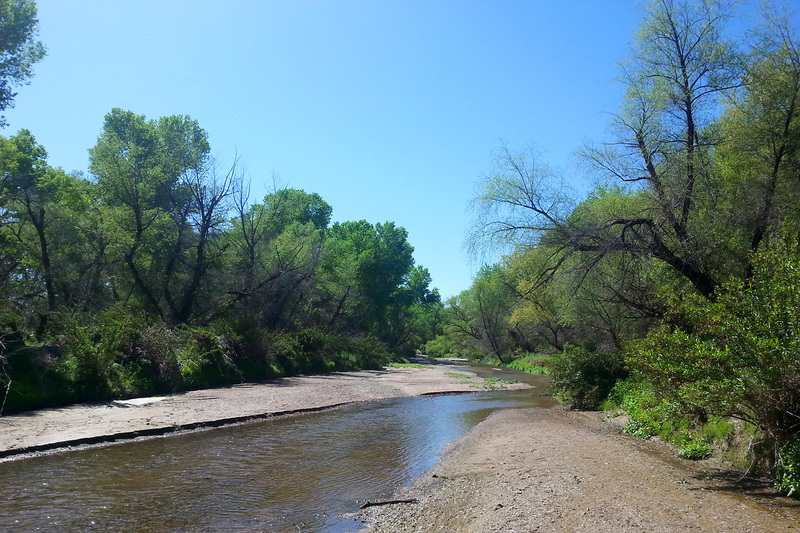 A few migrate along the San Pedro River, but the major concentration passes north along the Santa Cruz River. 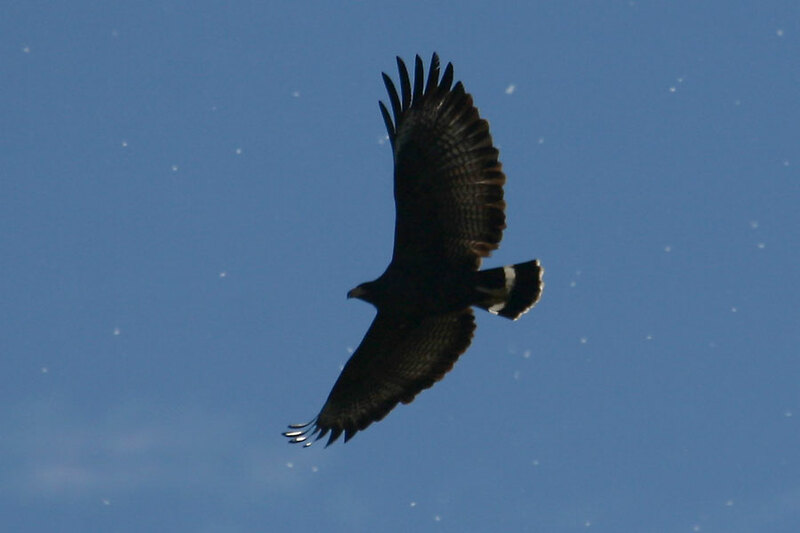 Most Common Black Hawk migration records come from the Santa Cruz River valley around Tubac, and further north to the NW of Tucson. A few reports come from the Upper San Pedro River valley around Sierra Vista, and the Lower San Pedro River valley around Dudleyville, where they are arriving on territory. 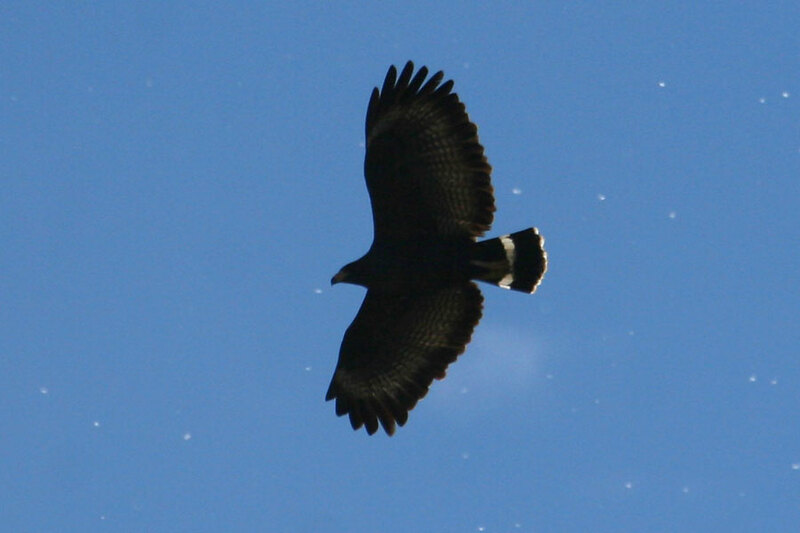 Other clusters of spring records of Common Black Hawk come from the Patagonia and Tucson areas. 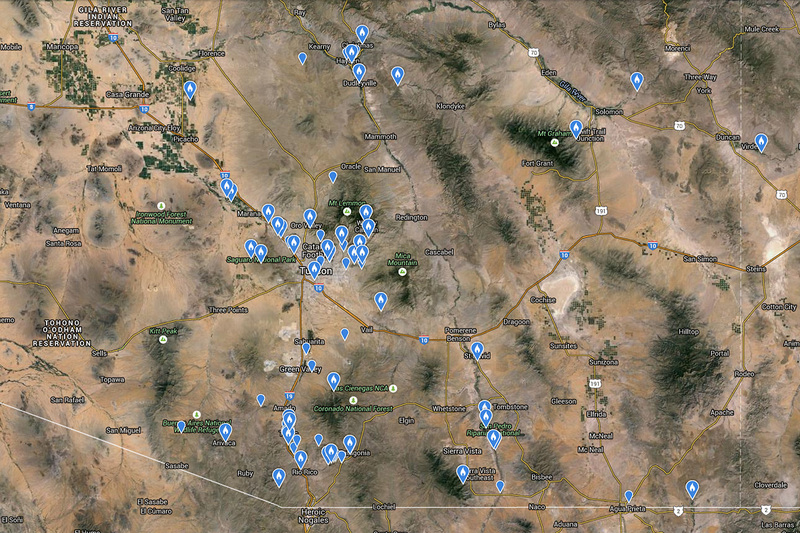 Common Black Hawk breeds at select sites in central Arizona, mostly to the east and north of Phoenix (see map, below). 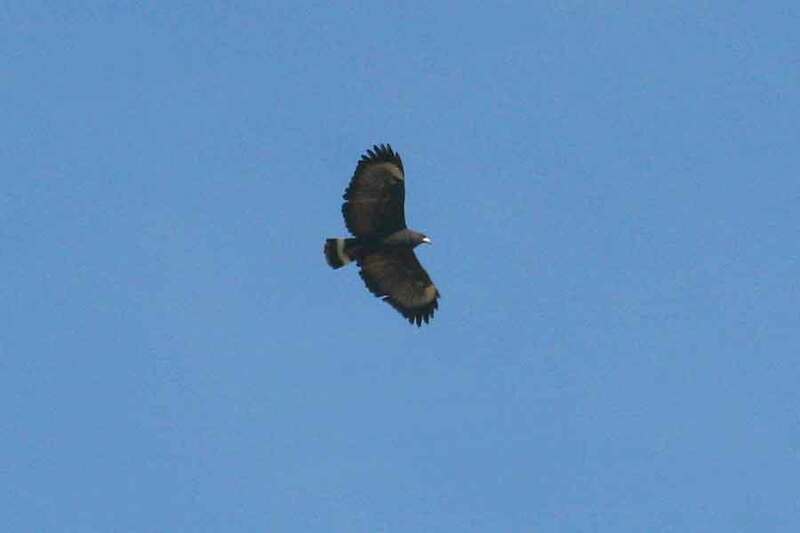 The southernmost regular breeding sites of Common Black Hawk are Muleshoe Ranch, east of Tucson, and Arivaipa Canyon and the Lower San Pedro River around Dudleyville, north of Tucson. A few recent summer records may indicate a tiny local breeding population of Common Black Hawks in SE Arizona, with reports from Rose Canyon Lake in the Santa Catalina Mountains, Peña Blanca Lake, Patagonia Lake, and the Chiricahuas. Spring Migration: any vantage point that offers a good view over the Santa Cruz River valley, from Nogales north to NW Tucson and beyond. 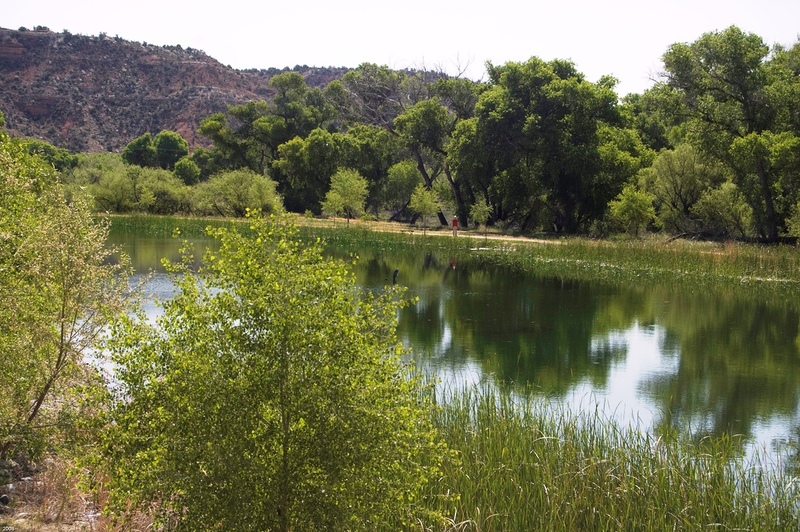 The most popular point is Ron Morriss Park in Tubac, where a regular hawk watch has been established, logging sightings of Common Black Hawk and other raptors throughout the whole month of March. Likewise, any point that gives good views of the the San Pedro River valley, although far fewer Common Black Hawks use that route. 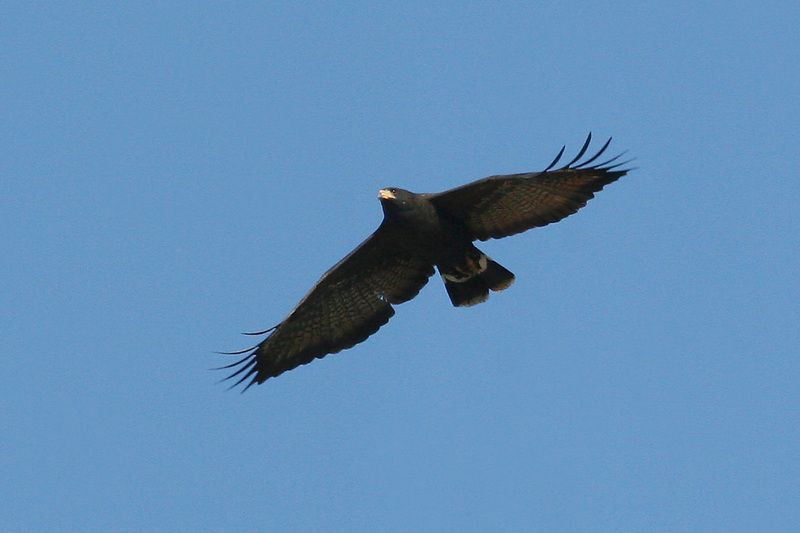 Breeding: Regular breeding sites for Common Black Hawk include the Lower San Pedro River around Dudleyville and Winkelman, Aravaipa Canyon, the Gila River, various sites to the east and north of Phoenix, around Prescott, around Cottonwood (Dead Horse Ranch State Park is a well-known site), Sedona, and Oak Creek Canyon. During migration, joining the Tubac Hawk Watch makes the most sense. More pairs of eyes means more chance of finding migrating hawks. The hawk watch takes place for the whole month of March, every day from about 8:00 a.m. to midday, sometimes longer. 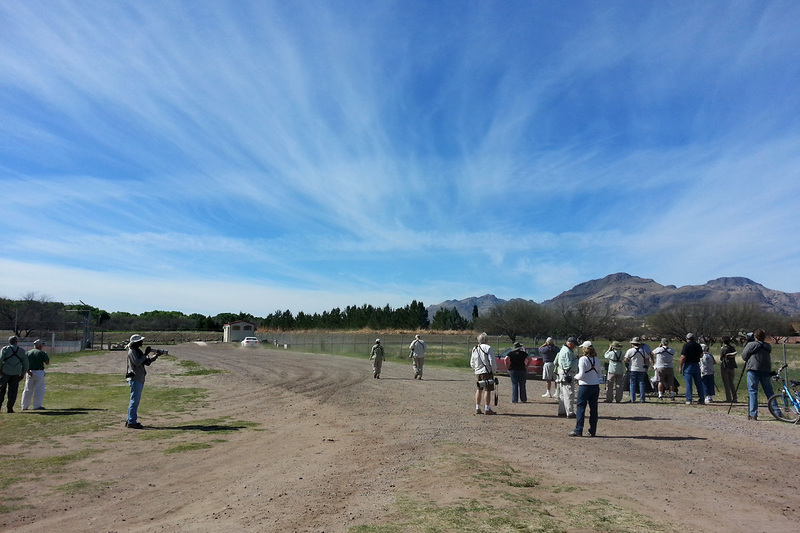 Just make your way to Ron Morriss Park in Tubac, introduce yourself to the other birders, and let them know you’d like to see a Common Black Hawk. The hawks usually stay in their roosts for the first hour or two of the day, waiting for the thermals to develop that make migrating easier. It is sometimes possible to find resting Common Black Hawks before they lift off, by checking the largest cottonwood and willow trees. The peak hour for Common Black Hawks passing through Tubac is 9:00 – 10:00 a.m., but this can vary every day due to weather conditions. Cold, rain or wind, or a weather front coming in from the north, can delay migrating Common Black Hawks for a day or two. Those are bad days to watch for hawks migrating, but can be good days to find grounded hawks resting in cottonwood and willow trees. The day or two after a weather hold up can be an excellent time to watch for migrating Common Black Hawks, as the backlog of hawks passes through. Common Black Hawks are largely silent on migration, but they will occasionally call, so it doesn’t hurt to know their vocalizations. 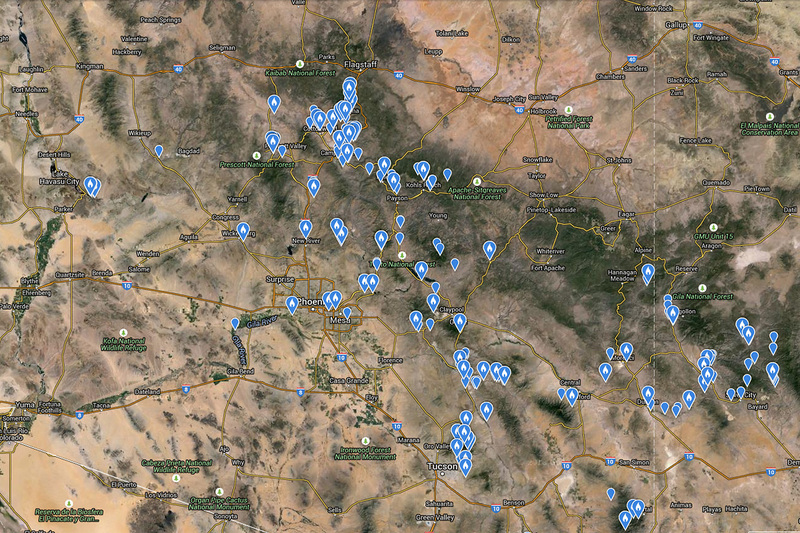 In order to find breeding Common Black Hawks in central Arizona, visit one of the various known breeding sites. Common Black Hawks make large stick nests in cottonwood and willow trees near water, and they are usually quite easy to detect. Listen for their distinctive calls. This is a rare breeding bird in the USA, so please behave responsibly at Common Black Hawk nest sites, keep your distance, refrain from playing tapes and any other acts that may harm the chances of breeding success. 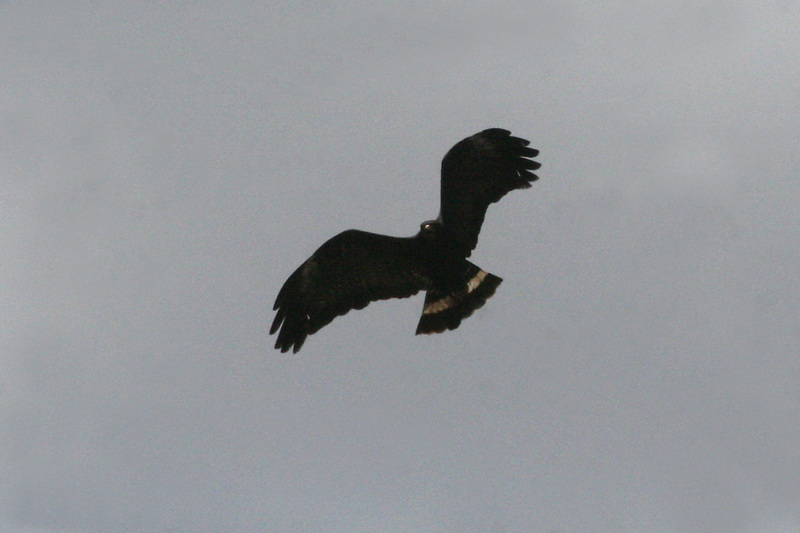 The classic wing shape of flying Common Black Hawk – broad, with bulging secondaries, almost reaching the tip of the broad, reasonably short tail – is usually an excellent ID feature. At times it can be extreme and easy to see, such as this bird (below). But at some angles, when birds are taking off or landing, swooping or diving, or any other flight behavior, this broad wing shape may not be so apparent. The following sequence of photos show a bird shortly after lifting off. 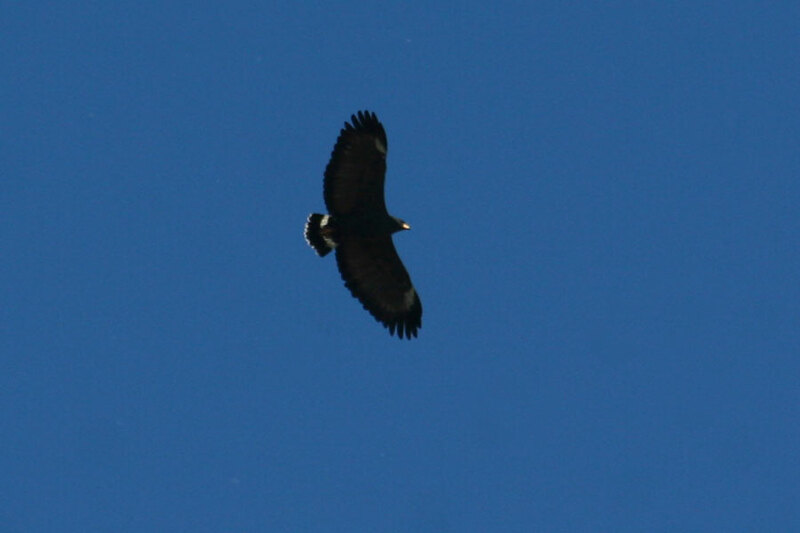 See how the classic Common Black Hawk wing shape is not particularly noticeable until the third photo. Learn to be patient if you can’t see the full wing shape right away. To some extent, telling apart distant Zone-tailed and Common Black Hawks lifting off or soaring in the distance can be likened to distinguishing between Turkey and Black Vultures doing the same. The lighter, thinner winged, more agile Turkey Vulture or Zone-tail Hawk is able to glide more efficiently and for longer, whereas the heavier, broader-winged Black Vulture or Common Black Hawk has to punctuate its shorter glides with several quick, shallow wing flaps. 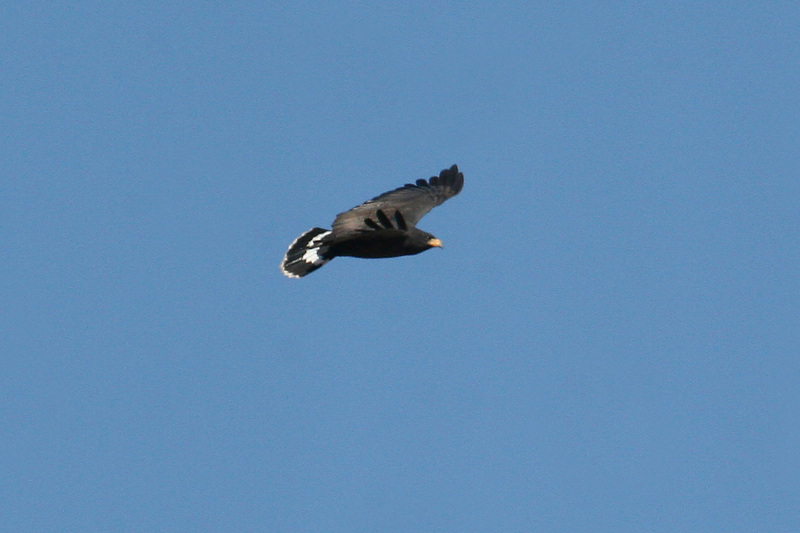 Birders often look for the single white tail band of Common Black Hawk, which is a pertinent ID feature. But it should never be relied upon alone. 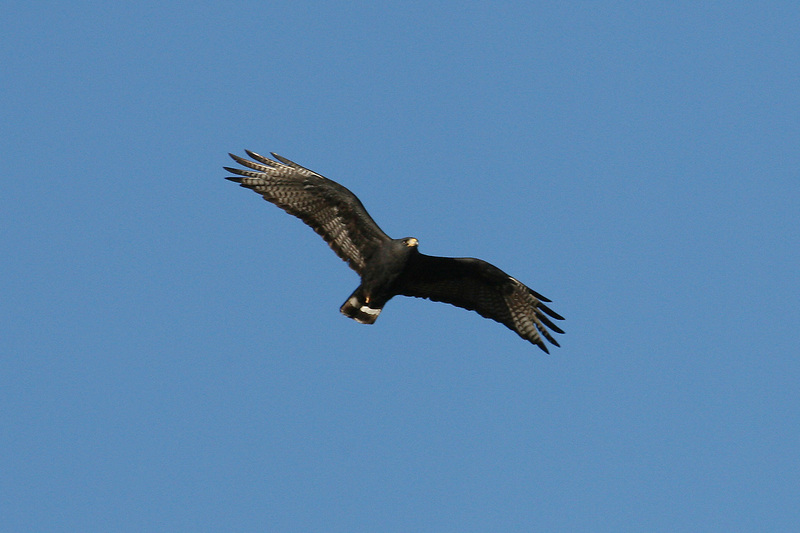 Zone-tailed Hawk is a very similar bird, but with multiple white tail bands. However, like the one in the photo below, with most views of Zone-tailed, you can only see one tail band. This is especially so when seen from below, which is the norm. So, an apparent single tail band is not a clinching ID feature for Common Black Hawk, unless you’ve had extremely close views and can categorically rule out any additionally tail bands. Use it as part of a suite of features to ID Common Black Hawk, which also include the broad wing shape, relatively short tail length, large bill size, and underwing and upperwing patterns that differ from Zone-tailed Hawk.